Woolies is going, going, gone -- Let's have it ! Tomorrow may be the last day you can shop at Woolworths, a high street chain that has existed for nearly 100 years in Britain. It caused quite a stir at the time of the launch, with a clever marketing tactic – everything was sixpence. It opened in the UK in Liverpool in 1909 but the first stores were nickel & dime (everything 5¢ or 10¢) shops in the US which had been going since 1879. Local mid to large-size towns where I grew up all had a Woolies, and I remember it for pick ‘n’ mix, 45s (singles), tapes, CDs and stationery. 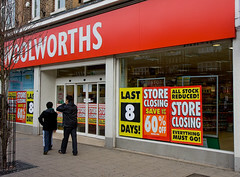 Letchworth had a Woolworths which was closed down in the late 80s, only to come back many years later, now closing again. Possibly a victim of e-Commerce, the stores have no major draw for impulse purchases compared to stock that is increasingly available at hypermarkets. They always had a low quality, low cost aspect and the chain has perhaps had its day – indeed town centre shops in general have really changed since the 1980s when I grew up. A visit to Woolies – in Hitchin in particular – used to be a regular thing for me when I was at school. I remember browsing records and later CDs, buying sweets and occasionally looking at the back of the shop for other household items and the occasional gadget or Christmas present. Bye bye Woolworths, my childhood shopping days are now truly gone. If you have any Woolie(s) memories, why not share them by commenting on this post. This entry was posted on Tuesday, December 23rd, 2008 at 11:23 am and is filed under general, nostalgia. You can follow any responses to this entry through the RSS 2.0 feed. You can leave a response, or trackback from your own site. I remember from my childhood browsing around in Woolworth’s in Warrington – then in Lancashire. There was a wooden floor and they sold spectacles, which for some reason I found fascinating. I longed for a pair! Wish I could do without them now…. Woolies was also famous for its records 45rpm, copies of current hit records sung by obscure bods never heard of before or since. Actually in my mother’s time, Woolies had a singer in the bigger stores who sang the latest releases to attract buyers to hurry and purchase the piano accompaniment music. I think I still have a copy somewhere of my grandfather’s favourite – “Oh! Play to me Gipsy (the song I love)”. They always had the next bit in brackets with the title for some reason. Ice cream was another big issue whenever we approached Woolworth’s. They sold the soft ice cream in cornets from a new machine when I was about 5 – that will be in 1951 – and it was a source of amazement to my (then) only brother and I. However we knew better than to ask for any! If it was offered we were in seventh heaven but this did not happen very often. Cary Grant had a connection to Woolworth – he married the heiress to the empire (can’t remember her name, think it was Barbara something) and coined the nickname for the couple “Cash and Cary” – get it????? In Warrington the manager of the store had a big house, large chauffer driven car (in the 1940s and 50s), sent his children to private school and also had another residence on Anglesey where they spent the summer with a nanny and a maid in attendance! Don’t know what store managers earn now but it would not buy that lifestyle! I know because he lived next door to my great-aunt. It’s good to have a wallow in old memories and nostalgia now and then but a great pity that that is all Woolworth’s will be for us in future. I got £1.50 pocket money every week as a young teenager and I bought a vinyl single every week from woolies. I always got invited to parties because I had the records. Some good ones there too – prince charming (adam and the ants) One love (bob marley) stone roses, happy mondays, deelite, etc. @Mum: I’d forgotten about Woolies releasing cover versions of hits, in fact I think some of them charted. Do remember the manager living nearby though. @Anna: I must have bought a few records there too, probably a bit less cool than Bob Marley though – but definitely bought some Jam 45s (including Beat Surrender) from Woolies. Stone Roses were a bit later though. Did you have a Woolies in Kingsbridge though? My first makeup came from woolies – green eyliner !! When we went back to England we always headed for Woolworths – where else could you get pic and mix? I always preferred the shops where they weighed out a quarter of an ounce a pound of sweets from the big jars, especially Wine Gums and Lemon Bonbons. I must have bought a lot of Pic ‘n Mix at Woolies too though.